The dreaded double pointed needles! 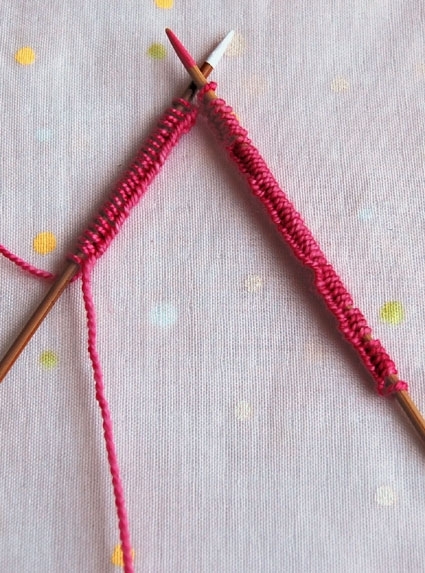 Learning to use double pointed needles is probably the biggest leap a beginner knitter can take into the world beyond scarves. 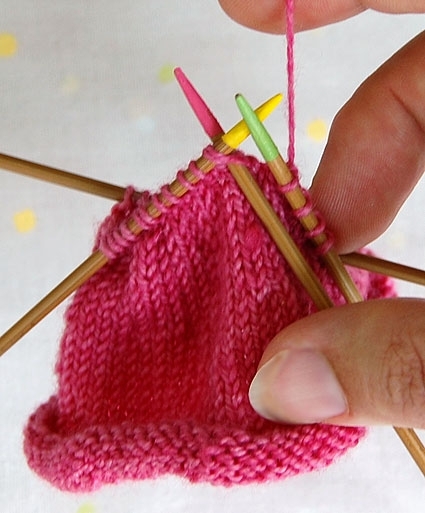 Hats, sleeves, mittens, gloves, socks… all pretty much require the use of double pointed needles. So if you’re ready, here we go! 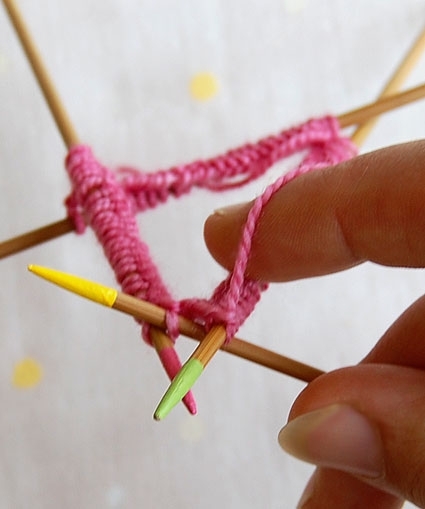 Double pointed needles are used to knit things in the round that are too small for circular needles. 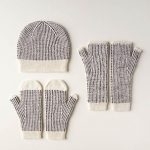 For example, when you knit a hat on a circular needle, toward the top of the hat the stitches become so few that they no longer reach around the circular needle. At that point you need to switch to double pointed needles. 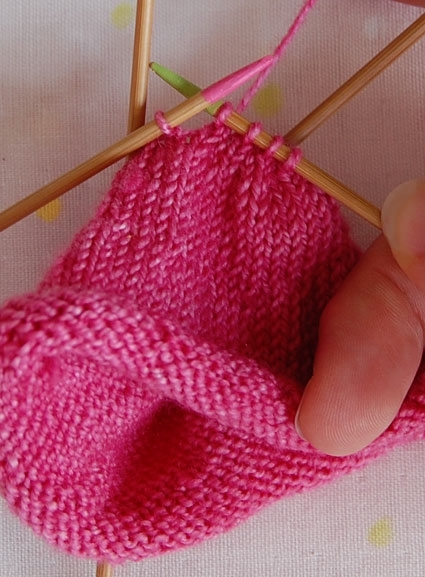 Other projects start out too small for circular needles, like the Toadstool Baby Rattle, which is the project this tutorial is illustrating. If you’ve never knit anything in the round before, it’s very important to know that you never turn your work around when you knit circularly. In other words, the right side of the fabric always faces you. The major consequence of this is that some stitch patterns are different in the round than they are flat. For example, to knit stockinette stitch in the round you only use the knit stitch; you never purl. As you gain experience, this concept won’t sound so complicated! Double pointed needles come in a pack of five, but the knitting tradition in America is to usually use only four at a time. 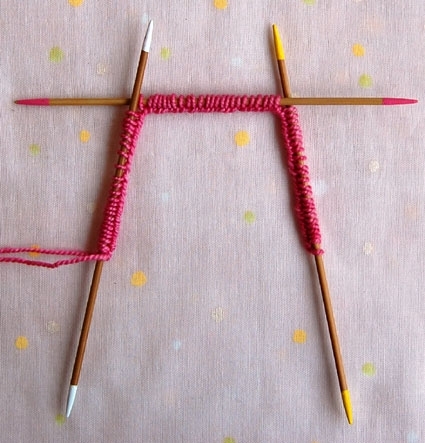 Three needles hold the stitches while a fourth knits them. Sometimes you do use all five, four to hold the stitches and the fifth to knit. This would come in handy when the pattern increases or decreases in multiples of four or if you can’t fit all the stitches onto three. 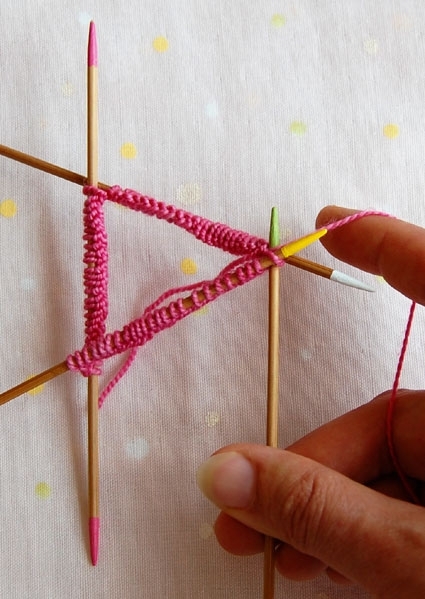 Either way, the instructions are basically the same, but this tutorial illustrates the more common use of four double pointed needles. And, finally, I painted my double pointed needles four different colors to help you keep track of which needle is doing what! In order to join for working in the round, you need the needle where tail and yarn are coming from (the “white” needle) in your right hand. This usually requires that you flip everything around, the needle in your left hand switching with the needle in your right hand. Arrange the stitches so they are all facing the same way and aren’t spun around on any of the needles. Insert the fourth (empty) needle into the first stitch of the left needle. Firmly knit the first stitch. You’re joined into the round! Continue to knit across the stitches of this first needle. 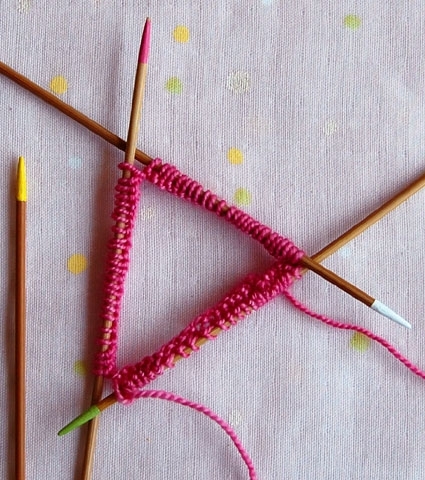 Just pretend that you’re knitting with two needles instead of four! You don’t usually need a marker to indicate the end of the round when you use double pointed needles. Instead, the end of the round is marked by the cast on tail. The first stitch of the needle where the tail comes from is the first stitch of the round. If, occasionally, you do need a marker, it’s easier to put it after the first stitch so that the marker doesn’t keep sliding off the needle. Just remember that the first stitch is actually the one before the marker. 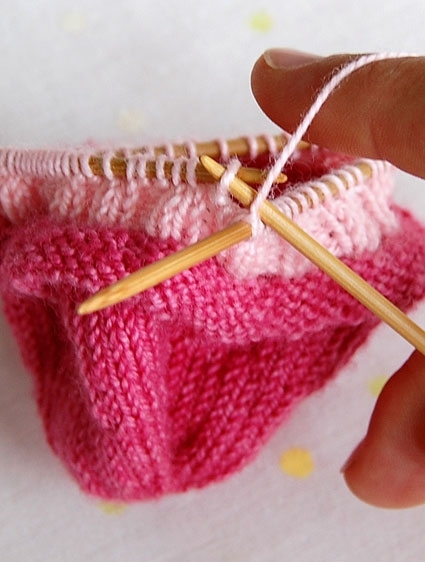 This helps to prevent a column of loose stitches at the intersection of the needles. 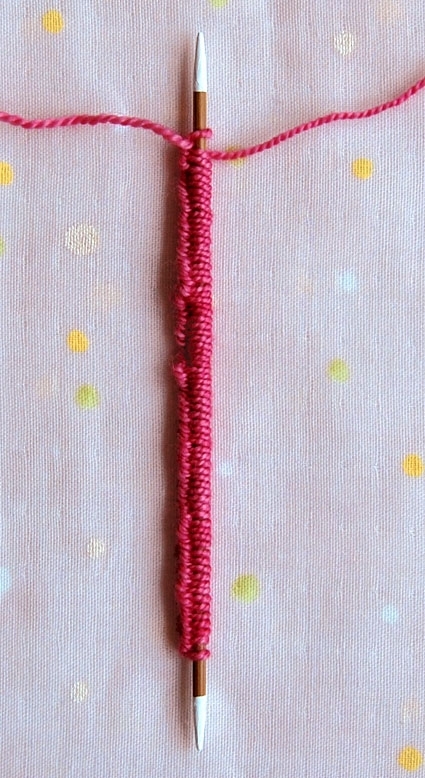 If the first stitch on the needle is a purl stitch, then it’s better to start the new needle above the previous needle. Also, always give the first stitch of each needle a bit of an extra tug to close the gap between needles. then slip that 1 stitch to the next needle, and do the decrease at the beginning of the next needle. That’s about it! Good luck with this new skill. I hope that it opens many knitting doors for you! Thank you for reaching out! Short Rows can be a bit tricky on dpns. 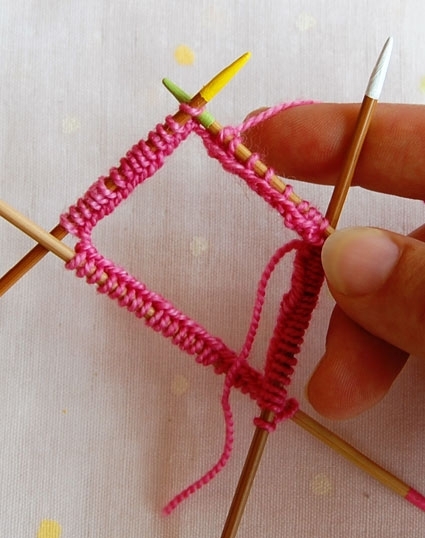 If possible, I would suggest you switch to circular needles which will eliminate the issue of coming to end of your needles for your wrap and turn. I would also suggest making your wrap and turns if you are having trouble seeing where they are. I think you will also find our short row tutorial helpful, just so you can see a visual explanation of the stitch. Hi there, thanks for this tutorial! 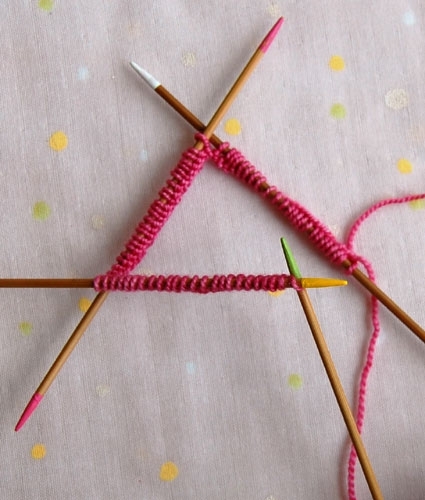 Can’t you point me towards a tutorial that would show how to join for knitting in the round with DPNs when using a provisional cast one (1step method)? Thanks! Thanks for reaching out! 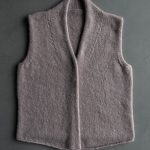 While we don’t have a tutorial for this exact technique, all you need to do is, after working your provisional cast on using waste yarn, knit one row with your main yarn without joining in the round. You will then be able to join your work in the round as usual when you start your second round of your main yarn. I was beyond myself with frustration trying to knit in the round with DPNs. The painted needle tips were genius! You saved my sanity and my project.